photo above: ART-13A sn:2054 from 1944 "as found." Dusty and dirty but essentially complete and original. The knob nomenclature is worn but the panel lettering is in good condition. The lock bar plates need repainting. The yellow tag laying on the lid is an acceptance tag indicating "ready to use." Note the cover from the tuning booklet is in the pocket. October 12, 2015 - I picked up this ART-13A today in Sparks, Nevada. It was very reasonably priced (ten dollars) probably because of the condition of the interior of the transmitter. It had a lot of "mud dabber" (wasp) nests inside. I figured that, at the least, it would be a good "parts set." When I got it home I was then able to inspect it closely. Overall, sn: 2054 was very complete although very dirty. The only thing missing was the tuning book and at least the cover of the book was present in the pocket. All of the knobs were in un-chipped condition. The plastic cover over the tuning chart was gone but the paper chart is in pretty good condition. The yellow tag that was tied to the left grab handle was a "ready for use" tag that indicated that the transmitter had been tested and was found operational in 1954. On the downside, the "keying" decal by the KEY input jack is badly deteriorated as is the decal on the lid. I decided that if the ART-13A passed all of my initial pre-tests, it would probably be a good candidate for a rebuild. Quick Check - Oct.16, 2015 - I tested the modulation transformer and found it to be the older style with 150 ohms DCR Screen winding. All windings tested fine. Also, both meters tested okay. K-103 and K-104 tested okay. All chokes tested okay. I also discovered that the MIC Switch was "safety wired" in the Carbon position. This is typical for an ART-13 straight from the military. These tests assured me that the most important parts were okay and the transmitter would probably be fairly easy to get operational. photo left: SN 2054 output section doesn't look too bad. Dust, dirt and a few wasp nests in the front left corner. These nests wrap around the TEST switch and somewhat surround the RCVR antenna input terminal. Update October 26, 2015 - It looks like ART-13 sn 2054 is going to require substantial disassembly in order to remove all of the wasp's nests. I checked the controls to see if they rotated freely and found that Antenna Loading E was immoveable and High Frequency Tuning Coarse A felt "locked" but it would "rock" somewhat. First though, I wanted to test my wasp nest removal process and see if it was going to work. I removed the FCI module and the Audio module to clean that area of the transmitter chassis. I found that Glass Plus spray and a small acid brush did a pretty good job at removing the wasp's nests. It was very messy but essentially the nest disintegrates and you're left with Glass Plus and wet dirt. Every so often there would be some insect debris mixed in with the mud. I had to be careful not to break any components or wires so my technique was to spray the nest carefully (to result in only the nest getting wet) and then brush the wet nest with the acid brush. This was repeated until the nest disintegrated and all that was left was residual Glass Plus and wet mud. This was removed with paper towel pieces, Q-tips and dry paint brushes. Tedious work but the results were worth the effort. When I removed the ART-13 bottom cover I could see why the Antenna Loading condenser wouldn't move - it was full of wasp's nests. This took about an hour to clean with Glass Plus and brushes finally resulting in an easy to adjust E control. I could also see the Multiplier Section had several nests that were responsible for the "locked" Course A control (more on this in "Problem Two - Serious," below.) I decided at this point it would be necessary to remove all of the sheet metal cabinet pieces to have full chassis access for nest removal. The photos right and below show the permeably tuned coils for the Multipliers that are located just behind the PTO. 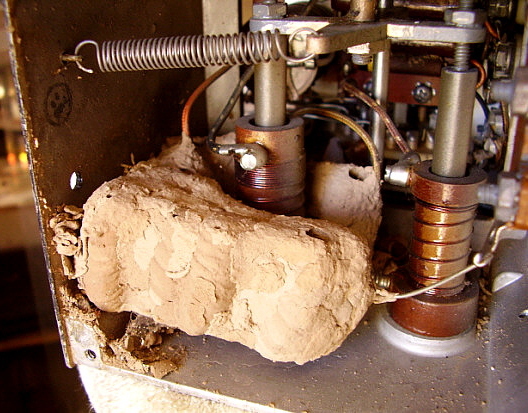 The wasps built this nest right around the 1st Multiplier coil form (photo right.) It took about an hour to carefully remove the nests with Glass Plus and brushes followed by a clean up of the area with paper towels, Q-tips and dry brushes. Complete access allows for a thorough "clean-up" of the disintegrated nest material and resulted in the transmitter chassis looking really nice. See photo below left. photo above: The permeability tuned Multiplier section after cleaning. The only sections of the ART-13 that didn't have wasp nests were the PTO and the Autotune. Both of these sections are very well sealed and were inaccessible to the wasps. This Multiplier coil section always seemed to "collect" the debris from cleaning. I had to repeatedly clean this area several times as dirt and "mud" always seemed to collect here. All of the wasp's nest were now removed (I thought.) I had to substantially disassemble the ART-13 as can be seen in the photo to the right. Only the PA output panel and the power input panels were not removed during nest removal. As can be seen in the photo, the wasp's nests didn't do any damage to any of the components or to the sheet metal and any minor residual nest material can be blown out of the chassis after it dries (since then it's just fine sandy dirt.) The next step was to further clean and lubricate the various contacts and switches that were affected by the wasp infestation. Reassembly and Testing - Nov 7, 2015 - I moved the transmitter and parts from the shop to the upstairs repair and test area for reassembly and testing. Once upstairs with better lighting, I saw there was yet another wasp nest buried in the Multiplier section. This was removed in the same manner as the other nests. More detailed cleaning followed until the transmitter could be turned upside down and no dirt or "mud balls" fell out. Body Work and Tube Testing - The reassembly did require some of the panels to be straightened. This was accomplished with oak wooden blocks as cushions and a weighted hammer. Though this sounds like rough treatment, the panels don't loose any paint and end up nice and straight. With all of the panels back in place, now it was time to test all of the tubes. The testing showed all tubes to be in excellent condition except one of the 6V6 tubes had an internal short. Next, was to apply some +28vdc and see how the Autotune worked. Problem One - Minor - Autotune - Before +28vdc was applied, I manually checked the operation of the Autotune by turning the main shaft by hand. Then I lubricated all of the bearings with 10W oil and greased the worm gears with red wheel bearing grease. I also lightly lubed each of the moving parts in each of the tuning modules. With only +28vdc connected to the ART-13 and with Channel 1 selected, the power switch was thrown and the Autotune ran to zero (correct) and then proceeded to run all the way the other direction and then stopped (not correct.) Switching channels didn't result in the Autotune running to zero again. Usually most problems with the Autotune are in the forward limit switch or the rear limit switch. In this case, the contacts on the rear limit switch were very dirty and cleaning with DeOxit got the Autotune working correctly. Problem Two - Serious - Nov 10, 2015 - We were now at a point where we could apply the +HV and +LV and see how the transmitter was going to work. This test resulted in no grid drive (well, at least we didn't blow any fuses.) The lack of grid drive was due to either the PTO or the first Multiplier not working. Further testing was required to determine the specific problem causing the lack of grid drive. A quick test showed that the PTO was operating. I measured the plate voltage and also used a pick up to see the PTO output on the oscilloscope. I did the same thing for the Multiplier tube and had both plate voltage and output signal but no grid drive to the 813. With power off, I attached one lead of a DVM (in ohms) to the input side of the Multiplier's output coupling capacitor and the other DVM lead to the plate of the 1st Multiplier tube. I should have had continuity but it showed open. Upon close inspection I noticed that one of the arms of the 1st Multiplier section switch was twisted and bent up therefore not making contact with the switch contact buttons (see photo right.) I was very careful not to "force" any of the controls during inspection so I'm sure this damage happened in the past when someone "test-turning" the controls forced control A while a wasp nest surrounded the switch arm. Forcing the control to move must have bent the switch arm as it pulled loose from the wasp nest. 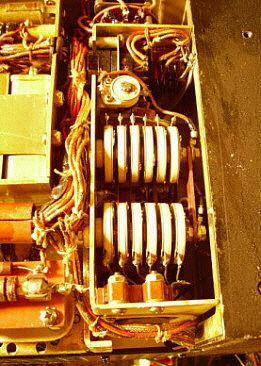 photo above: The Multiplier switch within the Multiplier chassis showing the bent and twisted arm of the switch. Access is rather limited but with special tools the switch arm was bent back to its correct position while maintaining its "springy" positive contact with the switch buttons. >>> The "power on" test still didn't have any grid drive with the problem being the PTO this time. With a rapid operation of control A back and forth a few times suddenly there was grid current. Although I had cleaned the contacts several times with DeOxit, apparently actual friction of the arm contacting the buttons was necessary to break through the oxidation or contamination. This time the ART-13 loaded up into a dummy load with no problems and had full output. Cosmetics - The knobs had most of the white paint fill for the nomenclature missing. The locking bars and their backing plates needed to be repainted. The black wrinkle finish needed to be reconditioned and touched-up. All of the cosmetic restoration was performed as described in the section titled "Refurbishing the Cosmetics" above in this article. As to details,...I used black nitrocellulose lacquer for all touch-ups and for painting the locking bars and their backing plates. At first the paint looks way too dark because the original wrinkle hasn't been reconditioned. Let the lacquer dry for an hour and then rub the wrinkle finish panel with a cotton pad that is lightly saturated with clean 10W machine oil. Wipe the panel down with a clean cotton cloth afterwards. The black wrinkle finish will now match perfectly the black nitrocellulose lacquer. I've found that using Mars Black Artist's Acrylic as a touch up paint is problematic and sometimes the touch-up looks somewhat "brown" rather than black, especially if Armor-All is used to enhance the original wrinkle finish. I'm getting much better and more consistent matching using the black lacquer and reconditioning the wrinkle finish with 10W machine oil. Reassembly - November 17, 2015 - At this point, the ART-13 had been completely reassembled and was looking very nice. I did have to do some body work on the tuning book pocket since it was bent in several places. I used oak blocks and a weighted hammer followed by touch-up with black lacquer. Further testing was necessary before the transmitter could be put "on the air." I wanted to make sure the Autotune was fully functional and that I set up the first several channels to frequencies that I use. I also needed to look at the waveform in AM on the oscilloscope to see that 100% modulation was possible. Finally, I needed to have the transmitter operating into a dummy load and then listen to the signal in a receiver that was not connected to an antenna. By listening to the receiver using a headset, I could get a very good idea of how the ART-13 would sound "on the air." Additionally, I needed to try the CW mode and verify that mode functioned correctly. The final tank coil was pretty dirty between the windings. Fortunately, the coil spacing allows access with a "horse hair" tooth brush with Glass Plus. The dirt can be brushed out going in the same direction as the winds. All chokes were also cleaned with a horse hair brush and Glass Plus. The Glass Plus evaporates leaving no residue. The area containing the 811s and the 813 tubes was MFP coated. There doesn't appear to be MFP anywhere else in the transmitter. Area cleaned with Glass Plus and various paint brushes. Tube sockets were cleaned with DeOxit. Switches were also cleaned with DeOxit. The three Jones' plugs were cleaned with DeOxit. Relay contacts for K-103 and K-104 were cleaned with 600 grit AluOx paper followed by DeOxit. 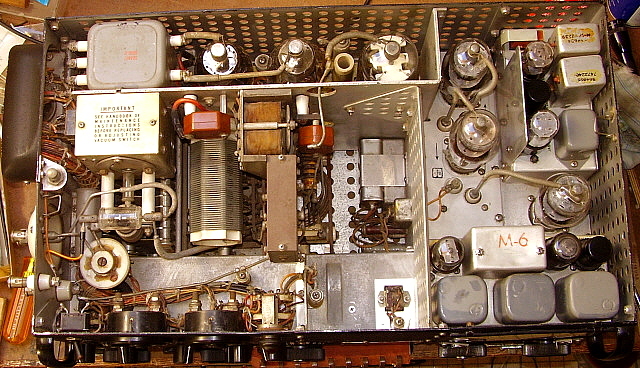 At this point the ART-13 was functioning using the Dyna-Sim AC power supply with the transmitter output connected to a 50Z ohm dummy load with air variable auxiliary condenser. However, the transmitter was still on the test bench. photo above: SN 2054 after cleaning, reconditioning and reassembly. photo above: The test set-up for SN 2054. Note the Motorola roll-cart. I got this from Dave Walker, who retired from his "Walker Electronics" business in Reno in 2012. The roll-cart was given to Dave by Bill Lear. Functional Test - November 19, 2015 - I didn't want to put SN 2054 "on the air" without first testing how the audio looked on the oscilloscope and how it sounded in a receiver. Shown to the left is a set-up for testing the ART-13. 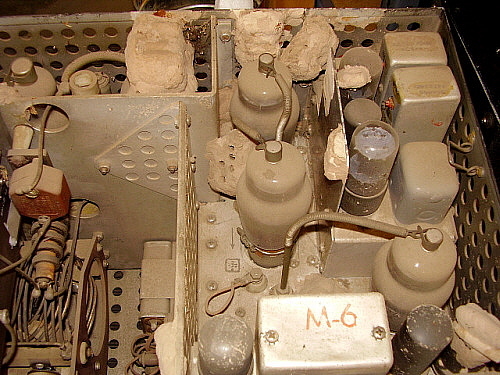 The Dyna-Sim power supply is on the floor but the cable can be seen routed behind the yellow tag at the left side of the ART-13. The mike used is a Shure 102-C carbon microphone. The metal box on top of the ART-13 is the auxiliary condenser. To the left of the transmitter is a Harrison 1KW 50 ohm dummy load. Further to the left is the monitoring receiver, a Collins R-388 (a 12" pick-up antenna is necessary since the receiver is well-shielded.) Note that the audio output from the receiver is to a 600Z ohm headset. This allows me to listen closely to the character of the audio from the ART-13 without feedback occurring. 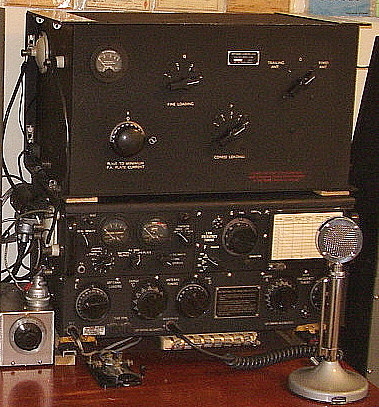 Not visible in this shot is the equipment to the right of the transmitter which consists of a 561 Tektronix oscilloscope, a General Radio Digital Frequency Counter and other various types of test equipment. The Penultimate Test - November 25, 2015 - While still connected to the dummy load, I verified that the ART-13 also sounded fine using a TUG-8 amplified base with the Audio Module switched to DYNAMIC. This position is used when the particular net being checked into isn't populated by military radio collectors. The ART-13 can produce excellent sounding AM when operated in this configuration. The next step was to connect the ART-13 to the tuned dipole antenna and actually transmit a signal. In this operating position I have other monitoring equipment to check modulation levels and transmitting frequency. I set-up four channels on the Autotune for the "most used" frequencies on 75M. I then telephoned KØDWC, who is located about 3 miles away, to have him listen at his station to my transmitted signal. This provides the penultimate test before actually going "on the air." Chuck's report was "an excellent sounding AM signal - clean, clear audio." The Final Test - Novemeber 28, 2015 - Of course, the final test is to actually use ART-13 SN: 2054 on the air during a regular AM net. My first net to try was the Saturday Morning AM net on 3870kc. This net is populated by regular AM ops so the reviews were from the perspective of "broadcast quality" audio. I used the TUG-8/DN-50 mike in the DYNAMIC position for hopefully the best quality audio response. Conditions were very good and all reports coming back were positive in both audio quality and signal strength. I was running SN: 2054 with the Dyna-Sim power supply so I was able to load the transmitter to about 150 watts of carrier power output. Antenna was a 135' tuned inverted-vee. Final Thoughts - So, I didn't have to buy anything to get SN:2054 up and running. I did have to put in about 12 to 15 hours of work to get the transmitter into functioning condition and looking pretty nice. All in all, it was a relatively easy project that was completed fairly quickly and the end result is a great condition, functioning ART-13A. These types of "projects" workout well for the ART-13 enthusiast that already has access to all of the accessories that are needed for restoration, troubleshooting, testing and operation. Update - September 12, 2016 - I've been using this ART-13A on a fairly regular basis, which would be about once a week. The only problem encountered has been an intermittent contact on one of the finger contacts in the Antenna Loading network (Course C.) The contact clears up with a slight rocking of Course C. This problem occurs rarely and then only when the channel is changed which actuates the Autotune. It's so minor I haven't tried cleaning the finger contacts but I probably will if it starts happening more often. I've set this ART-13A up running on the Dyna-Sim Solid-State power supply and it works with the 1948 National RCR Airway receiver. Upon setting up the "$10 ART-13A" as part of an operating station, I now had no way to operate the USN T-47/ART-13 transmitter. The thought of building another AC power supply didn't really sound like much fun but doing something different did. Why not operate this ART-13 on DC? To set up an ART-13 for DC operation was going to require that I find an operational dynamotor. I found one locally from an old military-collector ham friend of mine. It was a DY-12 which was the correct type for the T-47/ART-13. Though not in the greatest cosmetic condition, it was fully operational and came with the correct DC input connector. I still needed to find the DC output connector and another U7 connector. 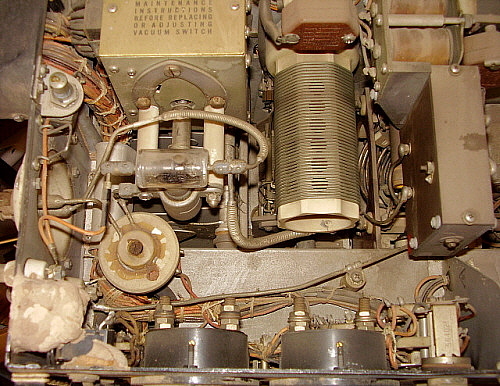 Additionally, a suitable cable had to be constructed for connecting the DY-12 to the T-47/ART-13. I bought the connectors off of eBay since this was the quickest way to get them here. 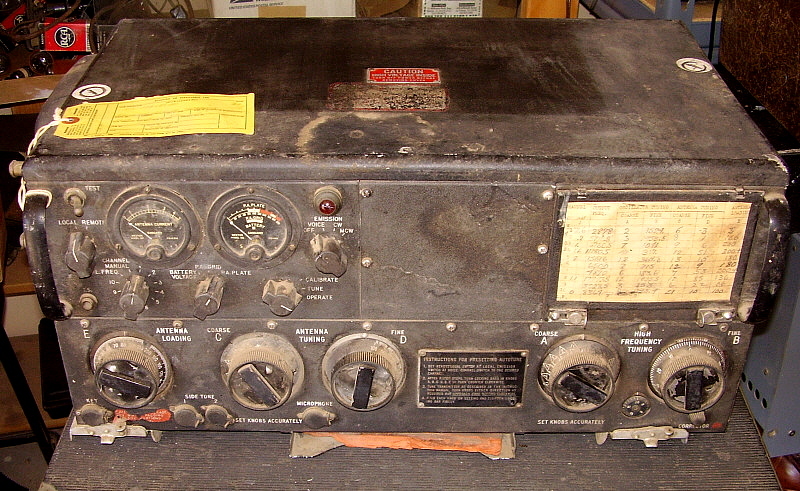 Onboard the aircraft, the typical receiver that was used with a DC operated ART-13A was the BC-348 (also operated on DC) to comprise an ARC-8 set-up. This set up would require about 6 amps for BC-348 dynamotor start-up and about 3 amps when in operation. The BC-348 would have its own power cable that would also attach to the PP-1104-C. I've run this set-up and, although the BC-348 is a great little receiver, it will usually be a challenge to Q-5 reception due to QRM. The BC-348 has a broad bandwidth so signals would be easy to find since the WWII radio op was "suited-up" in his electrically-heated flight gear that included heavy gloves and he was trying to tune the receiver while probably being shot at. Operating the BC-348 today, adjacent frequency interference will be heard. If it's bothering copy, switch on the Crystal Filter and zero the carrier of the received station (if you're on AM.) This will usually allow for decent copy under difficult Voice conditions. The BC-348 is an excellent receiver, but I wanted to run something different. Microphones - The ART-13 Audio Module has a "fixed-level" gain setting that was designed to work with specific WWII vintage military microphones with the ART-13 operating at its standard voltage levels available from the dynamotor. There are a couple of carbon microphones specified and a couple of dynamic microphones also specified in the ART-13 manuals. The Shure Bros. Co. T-17 was probably the most commonly used carbon microphone by the military. Many ART-13s will be found with the CARBON/DYNAMIC switch "safety wired" to the CARBON position. Carbon Microphones - There are two problems that are normally encountered with carbon microphones. First, the military expected the radio operator to "scream" into the microphone. After all, he was trying to talk over the aircraft noise and was probably being shot at! Second is that many vintage carbon microphones don't have the response they used to. Most military WWII carbon microphones will not allow enough audio for proper modulation due to "carbon packing," "carbon fusing" or other age and use related factors. You can buy replacement carbon elements but many times these are of old manufacture that just haven't been used (NOS) but they don't seem to work any better than the well-used older elements. This is probably due to "carbon packing" - another common problem. It's also possible to buy new carbon mikes that do seem to work very well because they haven't been subjected to any abuse and also the carbon particles haven't had time to pack together. Typically, you'll end up testing a lot of carbon mikes before you find an acceptable example. IMPORTANT - if you're having Carbon Mike problems - Check the value of R203 in the Audio Module of your ART-13. The original value of this resistor was 15K, which resulted in a carbon mike bias that was adequate for the typical T-17 when it was new. It wasn't long before the value of R203 was changed to 4.7K to give a higher voltage to the mike bias and therefore better response and gain. In the ART-13B schematics, the resistor value for R203 is shown as 4.7K. In all of the earlier versions of the ART-13, the value is 15K. Some carbon mikes will work fine with R203 at 15K but most won't. If your ART-13's R203 is 15K and you're fighting low response on every carbon mike you try, change R203 to 4.7K. I've found this upgrade on about half of the Audio Modules I've inspected, so it was probably incorporated into many ART-13s as they went through the military repair facilities. Dynamic Microphones - Many Dynamic mikes usually don't seem to fully modulate either but many times this is due to a mismatch of the impedances. Many of the vintage ham dynamic mikes were fairly Hi-Z, around 10K was common. This mismatch will result in low gain. You can use a matching transformer but that's really getting to be a hassle. Try to find a Dynamic mike that has an output impedance of 250Z ohms which is what the ART-13 is designed for. You might find that some of the newer 500Z ohm dynamic elements are also a good input Z match. An Easy Microphone Solution - The easiest method to have high output from the microphone, that allows you to run the ART-13 at a higher power output with 100% modulation, is to use a preamplifier between the mike output and the transmitter input. The Astatic TUG-8 mike stand is the easiest way to provide a preamplifier since a battery operated one is in the base of the stand. You can use any of the Astatic mike heads, e.g., 10-D, D-104, T-3, etc., and with the TUG-8 stand, these mikes will all sound fine and provide plenty of output. The preamplifier output Z is a fairly close match to the Dynamic input Z. Be sure to have the switch in DYNAMIC when using the TUG-8. Also, watch your transmitter's output waveform on an oscilloscope to set the TUG-8 "gain" control to proper level of modulation. The "gain" control is adjusted by a slotted shaft potentiometer that is accessed via a hole in the bottom cover of the TUG-8's base. Operating AM (VOICE) - Initially, an oscilloscope must be used to determine if the microphone chosen is really a suitable one for the ART-13. The oscilloscope will almost instantly show you whether or not you are achieving 100% modulation. The easiest way to use the oscilloscope as a "modulation monitor" is to connect a "pick-up wire" to one of the vertical amplifier inputs. The length of the "pick-up wire" will be depend on your power output, location of the antenna and how much vertical amplification you use on the 'scope. Most of the time a three foot wire works fine, sometimes you might have to use a 10' wire - experiment with what gives the best 'scope pattern. While transmitting in VOICE, adjust the 'scope for a modulation envelope pattern and you will almost instantly see if you have full modulation. Just a slight "touch" at negative 100% is seen as either a slightly brighter "dot" at zero or a short "line" at zero. Both are indications that the ART-13 is modulating to 100% negative and you don't want to go any further than that with your audio drive level. Note the positive excursion also. This should be symmetrical and at 100% positive. If you find that you are not achieving 100% positive but are at 100% negative modulation you might have weak 811 modulator tubes. Also, it's possible that there is some excessive current being drawn on the +HV which limits the positive peaks of modulation. You can reduce carrier power somewhat and see if that helps with the modulation symmetry. Operating CW - Many ART-13 owners don't operate the transmitter in the CW mode. This really isn't because of a lack of CW experience but mainly because there are some limitations to "comfortable" operation in the CW mode. The ART-13, like most military transmitters, uses a Keying Relay to provide many functions inside and outside the transmitter. Outside the transmitter would be the Antenna switching and Standby function between the ART-13 and the receiver that provides "break-in" operation in CW. However, the Keying Relay is noisy - no doubt, on the airplane it was probably barely noticeable, but the typical ham shack will be a cacophony of racket when the ART-13 is transmitting CW. Also, if you're a fast CW operator, the Keying Relay will limit your speed. Although the ART-13 manual says that 30 wpm operation is possible, 15 wpm is a more realistic "speed limit." There are some modifications to eliminate the Keying Relay operation in CW and key the various circuits directly but one would have to decide whether or not the CW mode on an ART-13 was going to be a major facet of operation that would justify "hacking up" the transmitter. Besides, operating the ART-13 in CW in the original configuration is authentic and provides the user with some of the experiences that the airborne radio ops had to endure. Antennae, Auxiliary Condenser and SWR - The ART-13 is not a ham transmitter, so it's not surprising that it doesn't readily operate into a dipole or quarter-wave vertical antenna. One of the idiosyncrasies of the ART-13 is that it was designed to operate into antennas found on aircraft. This was usually either a 20-60 foot end fed wire from the front of the plane to the tail, or a 200 foot long trailing wire antenna that was also end fed. Sometimes short whips were also used. Anyway, it's likely that no ART-13 ever originally operated into the 50 to 75 Z ohm unbalanced, low reactance (mostly resistive) type load that most ham antennas provide. The common solution is to add approximately 200pf to 800pf of capacitance from the COND terminal to the GND terminal which then provides a Pi-Network of sorts in Tuning positions 1 to 6. In positions 7 to 13, a Pi-network is already provided and usually above 7.2mc an auxiliary condenser shouldn't be required. Most amateurs operate the ART-13 in the 80-75M and this will require additional capacitance. SWR - Be sure when loading the ART-13 into an antenna that you use the lowest setting of C that allows tuning the transmitter to the antenna load. Although you can find higher settings of C that might appear to tune to the antenna, you might actually be tuning the transmitter to a harmonic instead. If you have an SWR bridge in the antenna line, look at the SWR and, if the antenna is matched for say 80M and you show a low SWR, then the setting of C is okay. 40M operation is very prone to tuning to a harmonic - watch your SWR and monitor your transmitting frequency. Frequency Monitoring and Why Zero Beating Doesn't Work - The easiest way to monitor the frequency of the ART-13 is with a digital frequency counter. The Counter can have a short "pick-up" wire connected to the counter input and that should provide sufficient signal for it to operate on. Normal AM net operations are on specific frequencies so it's rather easy to set the ART-13 up before hand. If you try to use the CALIBRATE position to zero beat the ART-13 tuned frequency to a received signal, you'll find that it doesn't work. The reason is the CALIBRATE position was to allow the radio op to use the FCI module's 50kc calibrate signal and to listen on earphones in SIDETONE for a heterodyne on the nearest 50kc cal point to the desired frequency for transmit. Only the PTO is in operation and it tunes 1000kc to 1510kc (in two ranges.) CALIBRATE was never intended for zero beating a signal in the receiver. 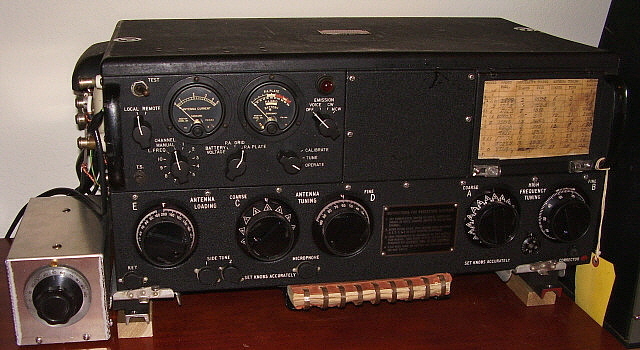 BC-348 Receiver Operating with ART-13 - ARC-8 was the designation for one of the most common set-ups for aircraft use of the ART-13 and combined it with the popular BC-348 receiver. Today, many hams run the ARC-8 configuration as it provides an aura of authenticity to a vintage military radio station (and the BC-348 is a great performing receiver.) The BC-348 can be wired into the U-8/U socket on the ART-13 to provide full break-in operation. Use pins 23 and 24 on the ART-13 U-8/U socket to provide a NC connection to pins 3 and 4 on the PL-103 connector on the BC-348 which will allow the ART-13 to control the stand-by function. Pins 23, 24 and 25 on the U-8/U socket access the internal sending relay in the ART-13. Pin 23 is Common (arm,) pin 24 is NC and pin 25 is NO. Using the R-390A with the ART-13 - The R-390 and R-390A receivers require a NO set of contacts for receive and going to NC during transmit for proper BREAK IN operation of the receivers. You can use pin 23 (arm) and pin 25 (NO) to provide a proper "Break-in" for the R-390 or R-390A receivers. Physical Location and Shock Mounts - There are a couple of different shock mounts that were used with the ART-13 transmitters. All of them are beyond difficult to locate. Probably when the transmitters were removed from service, the shock mount was left behind and scrapped with the airplane. Today, ART-13 transmitters are rarely offered or found with an original shock mount. When placing the transmitter in its location in the station you will have to simulate what the shock mount provided. Not the vibration dampening but the elevation of the transmitter up off of its bottom plate. This elevation was how the ART-13 cools itself - by convection. Use spacers made of wood or rubber to raise the transmitter up so there is at least one inch of clearance between the table and the bottom cover. Two inches is better. This is usually enough to allow air flow and cooling. >>> Make sure that the capacitor rotor is connected to both the housing and to the GND terminal on the ART-13. 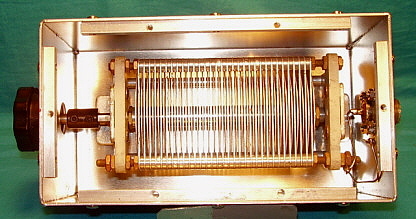 Since the rotor is connected to the capacitor's frame, mounting of the capacitor to the housing accomplishes the ground connection. I used an SO-239 UHF connector mounted on the rear of the housing that also connects to the capacitor frame and the capacitor stator connects to the SO-239 center terminal. A piece of RG-58/U coax with a PL-259 on one end and the other end having the shield connected to the ART-13 GND terminal and the center conductor connected to the ART-13 COND terminal is how the auxiliary capacitor is connected to the ART-13. The bottom cover is a flat piece of aluminum that the sheet metal shop cut for me. The bottom covers mount to 1/4" aluminum square bar that is mounted in the housing. Tapped holes allow mounting the bottom covers and small rubber feet are attached to the bottom plate. I painted one of my boxes black wrinkle finish and then used a spare ART-13 knob (D control knob is 0 to 100, 180º scale.) 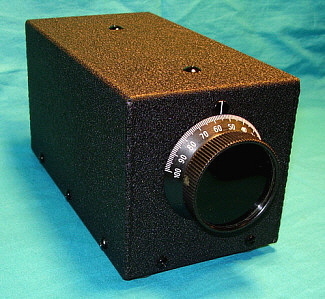 The finished Auxiliary Capacitor box looks very military and like something that should go with the ART-13 transmitter. Here are some photos of two ART-13 Auxiliary Capacitor Boxes. The air variable is 100pf to 1000pf. Connection is via a SO-239 connector using a short piece of RG-58U coax with a PL-259 connector running to the ART-13 COND and GND terminals. Loading up the ART-13 on 75 Meters - If you read the loading instructions in the ART-13 manuals you are sure to be confused since these are written for operation with aircraft antennae. Hams generally are using a dipole antenna which will tune differently. First, make sure you have an auxiliary capacitor connected to the COND terminal to the GROUND terminal. This can be a fixed ceramic HV cap of around 500pf or a transmitting air variable that provides adjustable capacitance from 30pf up to 800pf. Depending on your air variable, you may have to use shunt capacitors to get up to 800pf. These are the steps to load the ART-13 up to a tuned dipole antenna using a variable air capacitor as the Auxiliary Capacitor. When using a fixed capacitor, you won't be able to vary the loading as much. Use Control E to see how much variability in loading you have. You can only increase capacitance with Control E if it was set for 200. This will increase the plate current in the configuration used on 80M. Normally, the value of the "fixed" Auxiliary capacitor is chosen to give some adjustability on Control E for the desired loading for the frequency and antenna used. NOTE: The ART-13 loading will vary somewhat depending on the level of +HV used. This description applies for +HV levels around +1400vdc. Higher or lower levels of +HV will result in slightly different resonant points for Control D.
40 Meter Operation - Operation on 40M is basically the same as 75M except that Control C will be advanced up to triangle #8 or higher. At this point, the output network is actually a Pi-network and although the auxiliary capacitor probably isn't required, it does make loading much easier if it is used. Interestingly, the 40M band seems to be split with Control A referencing 7.2MC as the point of change. Usually, when operating in triangle #8 on Control A the lowest frequency tuned is about 7.15MC so you won't be able to tune into the CW portion of the band. Switch to triangle #7 on Control A for operation in the CW portion of the 40M band and you'll find that entire 40M band can be tuned. You might find that the Grid Drive Current is down a bit on 40M, since the alignment procedure allows for reduced Grid Drive at the band edges. Dealing with the Stacked Trimmer Capacitors in the Multiplier Section - If you plan to do an alignment of the Multiplier stages to bring the Grid Drive up then be very careful of the stacked adjustment capacitors - they are very delicate and easy to break unless the adjustment tabs are checked to see that they can be moved without difficulty. When the ART-13 was initially aligned, a "locking fluid glue" was put on these condensers so the adjustment would hold under the conditions usually found on airplanes in flight. The "breakage" usually occurs when the adjustment tab is "forced" to move against the locking fluid glue. The first thing to try is using a heat gun to melt the locking fluid glue. Use the heat sparingly and try moving the adjustment while the trimmer is warm. The arm should easily break loose but be gentle and don't force anything. photo above: The delicate "Stacked Capacitors" for aligning the Multiplier Section of the ART-13. These caps have +LV on them, so be careful and use an insulated alignment tool. >>> When the stack is reassembled, the adjustments can then be made without breaking the condensers. When doing the alignment, be aware that there is +LV (about +400vdc) on these caps so be careful and use an insulated alignment tool. You can actually operate the ART-13 with the Grid Drive a little below the scaled area on the meter but if you have very low Grid Drive, you'll have to align the transmitter's Multiplier Section. Most of the Multiplier Section alignment issues are on higher frequencies - generally 7.0mc and higher. Usually there is always sufficient grid drive on 75 meters. 20 Meter Operation - 20 Meter operation is similar to 40M operation. You'll find that it is very near the top frequency that the ART-13 is capable of but usually no problems will be encountered. You'll probably have to have Control C at triangle #12 for loading up to full power. It's normal for the power output to be down slightly on 20M. I can get about 100 watts output on 20M with +1400vdc +HV. Again, if you encounter very low Grid Drive you'll probably have to align the Multiplier Section of the transmitter. Use the procedure in the manual and be patient because it is a tedious, time-consuming job. If you experience arcing inside the transmitter on 40M or 20M but not on 80M, it's probably a loading problem. Reset the position of control C first. If that doesn't help, try reducing the loading for lower total plate current. Most arcing problems are due to mismatched antenna loads. 30 Meter CW Operation - Since the ART-13 is continuous coverage from 2.0MC up to 18.0MC, it's possible to do some CW operating on the 30M band. This is a small segment from 10.100MC up to 10.150MC available for ham operation in CW/Digital modes only. Naturally, a general coverage receiver will have to be used in conjunction with the ART-13. Since most hams are using tuned dipoles for an antenna, be aware that these normally will work fine on harmonically related frequencies but may not allow loading on 30M. I just use a separate small dipole specifically cut for 30M. Dimensions are 23 feet per leg and I feed the antenna with coax and a 1:1 balun. Be sure to check the "30M Band Plan" PDF file because each segment of the 30M band is allotted to specific functions and modes. Also, 200 watts is the maximum power. 630 Meter Basic Info - This new Medium Frequency band is 472kc up to 479kc,...only 7kc wide. There's a band plan that allocates CW to the lower few kcs although CW is legal for the entire 7kc. Data transmissions are supposed to be in the top few kc. Operation is limited to 5 watts EIRP but since most antennae are so inefficient at 472kc, it could take perhaps 100 watts antenna input power or more to achieve the 5 watts EIRP. You will have to do some antenna modeling (calculations) to see the efficiency of your proposed antenna at 472kc and calculate what input power results in 5 watts EIRP. Additionally, you must submit your physical location to the Utilities Technology Commission for approval of operation on 630M. They will confirm that you are located more than 1km from the nearest power transmission line that might use controlled-carrier troubleshooting data on it. photo above: ART-13A with O-17/ART-13A LFO installed with CU-32 Antenna Loading Coil on top. How the CU-32/ART-13A Antenna Loading Coil Works - When in LF, the ART-13 PA output is at LOADING COIL terminal. On the input side of the CU-32 is the "LF" terminal which is connected by a wire or cable to LOADING COIL terminal on the ART-13. 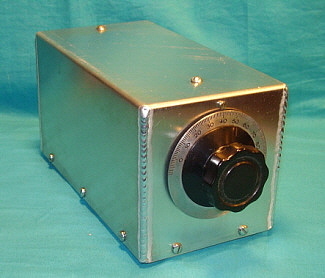 CU-32 "HF" is connected to the ART-13 HF RF output using a wire or cable. When the ART-13 is not in "LF" the CU-32 is bypassed by having the vacuum switch and relay actuation voltage removed so the CU-32 always stays in "HF" if the ART-13 PTT line is actuated. When not in "LF," the ART-13 HF RF passes thru to the selected antenna connections on the side of the CU-32. TRAILING or FIXED can be selected and this selection ability is always active and applies to either LF or HF. When "LF" is selected on the ART-13, then the RF output from ART-13 LOADING COIL terminal to CU-32 LF input is routed into the tuner circuit (via K-105 in the ART-13.) The CU-32 RF Amp meter is on the input side with series dropping resistors to chassis. Two parallel fixed-capacitors are from "LF" input to chassis. The "LF" input also connects to the loading coil/variometer. Taps are selected via the FINE LOADING. The variometer is used for PA PLATE TUNING. COARSE LOADING selects taps from the bank-wound coil under the Antenna switch. LF RF output is connected to the NO contact of the vacuum switch. "HF" input is connected to the NC contact of the vacuum switch. 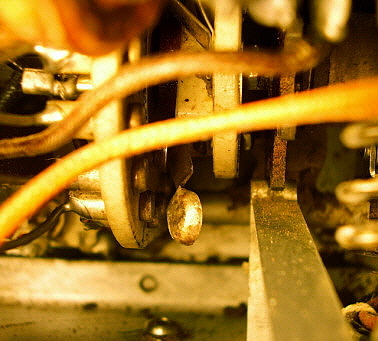 The arm of the vacuum switch is connected to the antenna switch that selects TRAILING or FIXED antennae. Actuation of the ART-13 PTT (key down) operates the ART-13 and the CU-32 vacuum switch which places the LF RF onto the particular antenna selected. The receiver is placed in standby via the ART-13 keying relay and the receiver antenna input is isolated by the CU-32 vacuum switch and by the vacuum T-R switch in the ART-13. 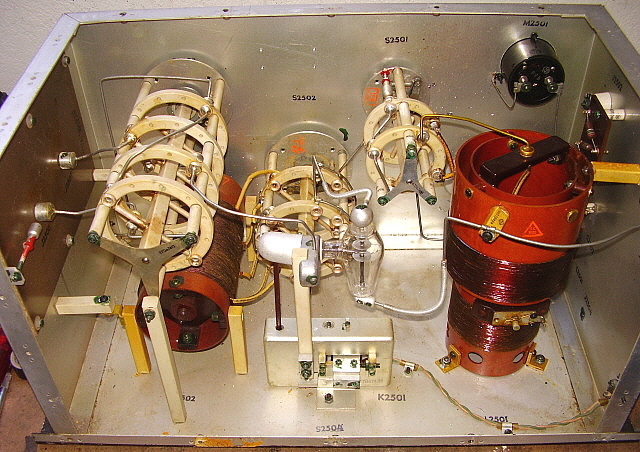 photo above: Inside the CU-32 ANTENNA LOADING COIL showing the various components. The ART-13 inputs are to the right while the antenna connections are to the left. The vacuum switch and relay actuator is center-rear on the chassis (K-2501.) The relay is inside the metal housing. 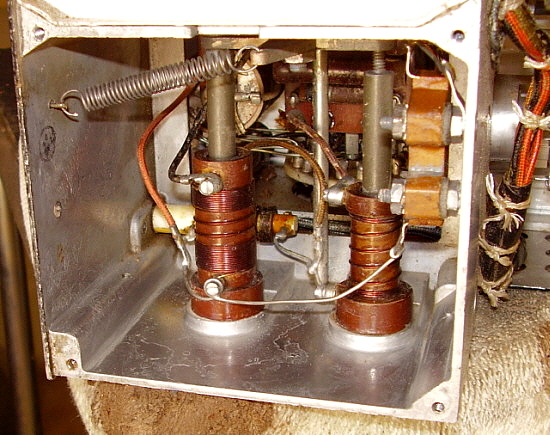 The fiber rod protruding out the top actuates the vacuum switch. This vacuum switch and actuation relay follows the keying of the ART-13 in CW giving the operator full break-in operation. The vacuum switch and relay operates on the PTT line and switches the CU-32 from "LF Input on transmit" to "HF Input on receive." Note the two spark gaps that are painted red. These are on the Fixed Antenna section to protect against arcing that is common with "short" antennae. Voice can't be used on LF with a Fixed antenna. 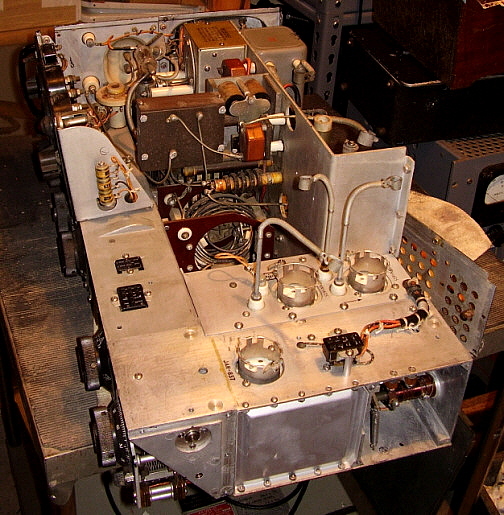 BC-348 Operation on LF with the CU-32 Loading Coil Tuner - The BC-348 was always connected to the ART-13's RECEIVER (J110) terminal. With LF selected on the ART-13, the vacuum switch inside the CU-32 toggles back to "HF" when the PTT line is deactivated (key up) and that then allows the BC-348 to connect to the aircraft antenna via the ART-13's "HF" routing through the CU-32. When PTT is actuated (key down,) the CU-32 vacuum switch toggles to LF which connects the ART-13 J-117 terminal to the CU-32 LF input. The ART-13 output is routed through the CU-32 to the selected aircraft antenna. The BC-348 is further isolated during "key down" via the ART-13's vacuum T-R switch. With PTT deactivated (key up,) the ART-13 and CU-32 return to "HF - Receive" mode. Since the BC-348 isn't routed thru the CU-32, the receiver's match to the particular aircraft antenna used would be dependent on its LF alignment on the Q, N and J versions. The other BC-348 versions have a front panel antenna trimmer for antenna matching although its effectiveness might be limited somewhat on LF. The BC-348 does tune 630 meters and it can provide decent performance if aligned correctly on its 200kc to 500kc band. Of course, your LF receiver doesn't have to be a BC-348. Any LF receiver can be connected to the ART-13 RECEIVER terminal and utilize the ART-13 remote standby function (U-8/U connector) for fully integrated operation on LF with the ART-13. Or, you can use an entirely separate receive antenna such as a tuned loop. On 472kc, the use of a tuned loop receive antenna will greatly reduce the noise level and boost received signals. Directivity of the loop is also an advantage. Operation of the ART-13 with the CU-32 on 630 Meters - Operation must be on CW. This mode of operation utilizes a keying relay in the ART-13 that essentially is "keying" the PTT line. The keying of the ART-13 also provides keying to the vacuum switch in the CU-32 via the U-11/U connector/cable on the ART-13 (U-11/U is only operational if LF is selected on the ART-13.) Since there are three relays involved, the ART-13 keying relay, the ART-13 vacuum T-R switch and the CU-32 relay/vacuum switch, all working with the radio operator's keying, the maximum CW speed will probably be limited to around 15 WPM. I tried a bug and even at slow speeds (for a bug,) it's too fast for the relays to follow and allow the ART-13 to key "dits" properly. A hand key must be used and top speed seems to be around 15WPM. Be sure to do your initial testing on LF with the ART-13 in the "TUNE" mode. This limits the power output to prevent excessive current flow when the PA is out of resonance. With a short end-fed wire of about 100 feet in length, you'll probably find that the two LOADING controls will be at maximum and the "plate dip" is fairly sharp. A 200 feet long wire will perform much better and will load up easier. The actual CW signal on 473.5kc from my ART-13/CU-32 combo running into a 163ft end-fed wire sounded loud, crisp and clean as received by KØDWC located a few miles away. I've also had a two-way CW contact with K6KBE from Ione, California (located just over 100 miles away.) I've heard WØYSE on 630M from Washington state but haven't worked him,...yet. Operating CW on the ART-13 with CU-32 is a very noisy experience. There are three relays "clacking along" with your sending. While the airplane was aloft there was so much other noise going on the sending relays were seldom heard, especially since the radio op normally was using 'phones. Not much can be done about the noise if you want to run the ART-13 and CU-32 as they were originally operated. Modifications to change any of the method of operation seems to go against the entire idea of collecting, restoring and operating WWII vintage military radio gear in the first place. Sure, it's noisy, but if you use a set of 'phones, as the old WWII ops did, it's not too bad. For Sidetone to monitor your sending, the ART-13 provides two jacks to access the sidetone circuit. There is a volume control that is located under the tuning chart. Use a 600Z ohm load, either phones or loudspeaker. You can also listen to the receiver if you're using a separate antenna. Since I'm using a remotely tuned loop on the receiver, I just turn the RF gain down and use the SP-600VLF receiver as the CW monitor. Actually, with this method, I'm actually listening to the transmitted signal which is probably better since any problems would become quickly apparent. Utilizing "Fixed Ant" and "Trailing Ant" for HF and LF Antenna Selection - The original intent of this switch was to select between a trailing wire antenna or a short vertical antenna, with both antennae being utilized for HF or LF operation. A more useable purpose for this switch is to use the "Fixed" position for the HF antenna. Then the "Trailing Ant" can be used for the LF antenna. When the ART-13 is NOT in LF, the CU-32 is bypassed except for the Antenna Selector switch. So, when operating HF switching to "Fixed Ant" will allow the HF antenna to be connected to the "Fixed" output terminal with the coax shield connected to chassis. Selecting LF on the ART-13 activates the PTT switching of the CU-32 and the antenna selector can be switched to "Trailing Ant" and a LF antenna used. I'm assuming that most ops are going to have a separate LF antenna such as a 200 ft end-fed wire but will use their regular HF antenna for 80M or 40M operation. Effective Isotropic Radiated Power - The EIRP limit of 5 watts is somewhat difficult to determine with any accuracy. This regulation seems to be in place mainly to limit the size of the antenna versus the amount of RF power used and thus to control the effectiveness of the transmitted signal. For example, a full-size 630 meter half-wave antenna is over 1000 feet long. This type of "full-size" antenna would actually exhibit a slight gain when compared to an isotropic radiator (+1.6db.) Therefore, the power input would have to be < 5 watts to stay within the regulations (assuming there were no other losses.) With a full-size antenna, even just 5 watts input would result in a formidable signal on CW. However, small, "city-lot-size" antennae will be very inefficient at 630 meters and therefore would exhibit considerable loss rather than gain. That's how the RF power input to a "small" antenna can be very high and yet only result in 5 watts EIRP. Think of the small, inefficient antenna as acting like a "dummy load." You can input lots of RF watts and it does radiate somewhat (a few feet) but it isn't an efficient radiator. So, to stay within the regulations, one has to know the efficiency of their antenna which is determined by the antenna's input resistance and its size. From efficiency and power input you can then calculate EIRP. Antenna resistance usually has to be estimated based on several physical factors with antenna size being the most important. The best information for answering the EIRP question can be found at www.472.org in their section on"630M Antennas" and "EIRP." Their formulae and examples indicate that the "average" ham antenna takes several hundred watts input to achieve 5 watt EIRP. Propagation and Successfully Receiving LF Signals - A lot of the conversations about prospective 630 meter operation seem to be concerned about the transmitted signal. Very little is written about how to successfully receive DX signals in "real time" on the lower frequencies. Propagation on 630 meters isn't groundwave only. At night, skywave propagation dominates this region of the spectrum. It's easy to receive medium wave Airport NDBs that run 25 watts out to distances of 1500 miles. Regional NDBs that run 100 to 400 watts can be received out to the east coast. However, these great nighttime conditions don't last long. Long wave enthusiasts consider the "season" to be from the Autumnal Equinox to the Vernal Equinox, or about mid-September to about mid-March. Actually, the best part of the "long wave season" is from late-November to about mid-January. This is when the conditions are the least noisy allowing very weak signals to be heard. So, fall and winter nights or very early mornings work best on 630M. Daytime is good for testing or for local QSOs. Your physical location is another important part of successful 630 meter operation. In noisy urban areas the RFI is so intense that virtually nothing can be heard below the AM BC band. In these locations, a shielded, magnetic loop is about the only type of antenna that might allow for some reception. These loops are shielded with a non-ferrous metal tube and, generally, the antenna only responds to the magnetic portion of the electromagnetic signal. A tunable amplifier is necessary with these loops (usually part of the loop design.) Since most RFI is electrical in nature, the shielded, magnetic loop provides some relief in noisy areas. Less noisy areas can usually receive DX using a remote tuned loop. These are just a fairly large coil of wire that's tuned with varactor diodes in parallel with the loop. A pick up loop is mounted within the loop field and that connects to the receiver. Usually, an amplifier isn't required on a remotely tuned loop. In quiet rural areas, it might be possible to use a wire antenna with good results. I use both a large wire antenna and a remotely tuned loop. I find that I can always use the loop antenna. Most of the time, only winter conditions are quiet enough to allow DX reception on the large wire antenna. For a complete write-up on how to successfully receive DX longwave signals using vintage radio equipment, go to my article "Vintage Long Wave Receivers" - go to the Home Index. 2. USAF - Radio Mechanics VOL. 1 - Extension Course 3012 - specifically on the ART-13A and the BC-348. Theory, operation, maintenance, course Q&As, informative about post-war uses and maintenance. 3. Electric Radio - N6PY Bill Feldman, article on ART-13 basics. Tells how to perform an initial checkout of an ART-13. Also, a mod on removing the "locking" current off of the Autotune motor when in standby. W6MIT John Svoboda wrote a couple of articles on ART-13 power supply design and on exactly how the loading network operates. 4. Various "Radio News" and other radio magazines from 1946 to 1950 - surplus advertising, conversion articles, prices and other information. 8. Thanks to the many conversations with other ART-13 users and enthusiasts that have provided so much information over the years.